Let the glass protector take the hit, not your phone. Screen protectors are essentially the most important accessory to buy with your smartphone today. They not only protect your phone from shocks and drops but also work against the gradual accumulation of dirt, fingerprint marks and scratches on your phone’s screen. 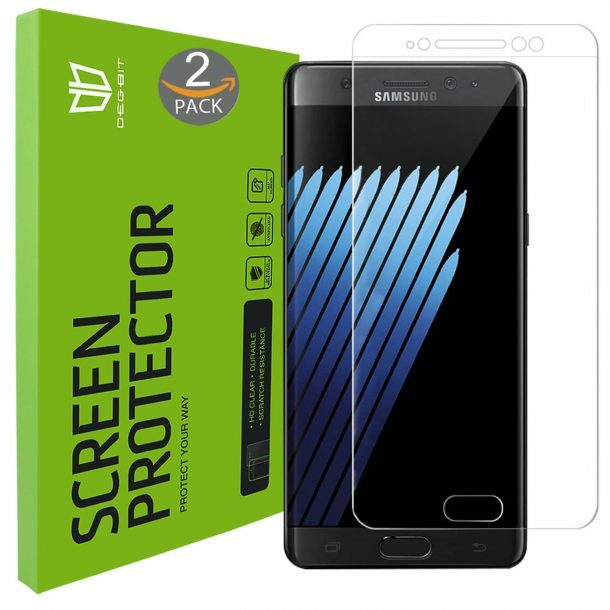 The following article lists the best, easy-to-use screen protectors that you can buy right now for your Samsung Galaxy Note 7. 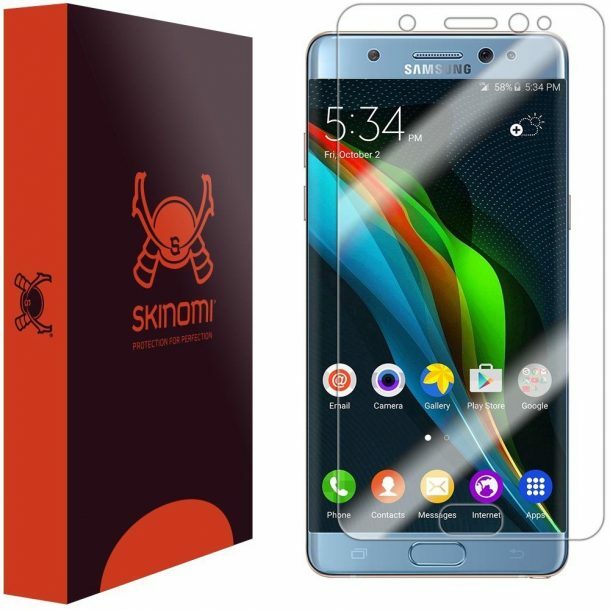 So check out this list of 10 best Samsung Galaxy Note 7 screen protectors and let us know your favourite screen protector in the comments section. This is flexible and tough screen protector specially designed for Galaxy Note 7 by G-Color. It works well to absorb shocks and drops and significantly reduces dust, oil and fingerprint smudges. The ultra-clear screen enables you to retain the original clear and sharp high definition display of your smartphone. This screen protector is scratch-proof, UUV-resistantand does not go yellow with time. This is Note 7’s case-friendly screen protector by Klearlook. This case friendly design covers the screen well and is compatible with all cases. The shield thickness is 0.1mm and is highly transparent and incredibly smooth. The unit is anti-dust, anti-oil, bubble-free and features an easy installation. The oleophobic and anti-smudge coating reduces fingerprints and smudges and come with clear instructions. “All parts looks excellent as described, and will add the comment when getting it work on the new phone. [Verified Purchase]” – Amazon’s Customer Review. 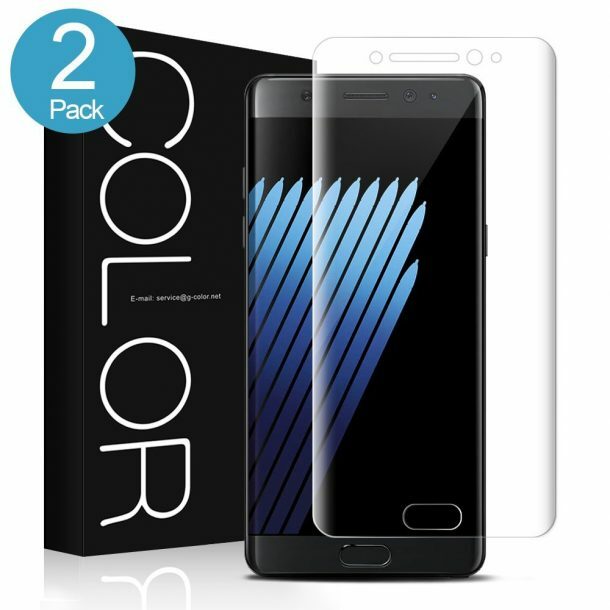 This is Note 7 case friendly screen protector with easy installation instructions. The unit is made up of high-quality material and features perfect adsorption, self-healing. It exhibits a high response to subtle touches and maintains the high definition ultra-clear display of the smartphone. It is sturdy and flexible and protects your phone from dust, scratches, smudges and fingerprints. It is also softer and appressed than other brand’s screen protectors. “After having broken my phone screen too many times to count, I realised it was time to either get a case or screen protector for my new phone. I cannot stand those huge phone covers, so this was the best alternative. For the price, this is the best deal on the market. I love that it comes with two screens. The screen itself was easy to apply, and I had no issues. The product is durable and does not disappoint. My only hangup is that I wish I would have discovered this two phones ago! I would purchase this again.” – Amazon’s Customer Review. 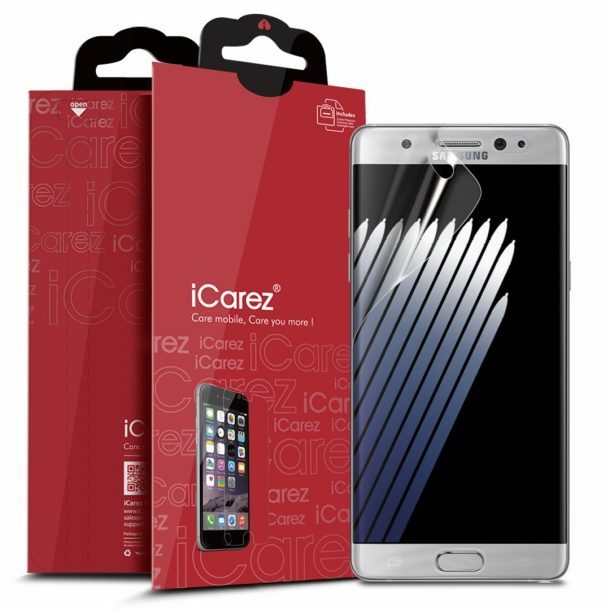 This is Icarez new anti-shock screen protector featuring new high definition clear material. The unit is bubble-free, easy to install and leaves no residue after installation. The high definition transparency ensures maximum resolution for retina display and TrueTouch Sensitivity. The anti-bacterial layer forms an invisible and solid protection for the touch screen. It also has perfect cut-outs on the front so its does not interfere with the sensors. “Icarez is my favourite screen protector vendor I ever used. I already tested more than 100+ screen protectors. Highly recommend this” – Amazon’s Customer Review. 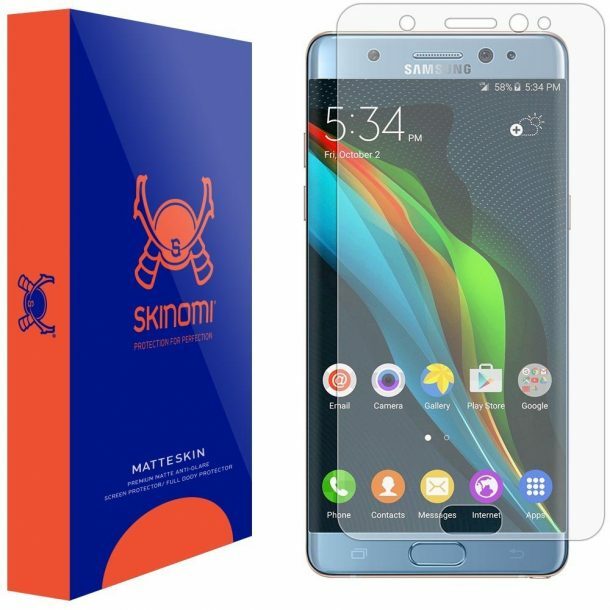 This protector uses military grade film designed to withstand scratches, dents, scrapes and anything that harms your device. The UV resistant layer prevents yellowing and ensures that your screen remains crystal clear. You can experience frictionless swiping because of the glass-like surface and the unique silicone adhesive layer ensures a hassle and bubble-free installation. The wet-install process allows for adjustments during the installation for better results when compared to traditional PET and Ballistic Tempered Glass protective covers. “This Screen Protector was so easy to put on. I was surprised at how smooth and perfect it went on. The instructions were pretty easy but fundamental. I used the alcohol-free cleaning sheet it came with; then I used the dry sheet also which dried up everything. I used the lint removed all over the screen to make sure nothing was on there and then I peeled the clear layer off. I lined the screen protector on the phone, let it go, and it pretty much applied itself to the screen. It was the easiest thing ever. I turned on the phone and was amazed at the clarity of it, and the touch screen was not affected by the thickness of the screen protector. So far there are no fingerprints left behind that I can see.! !” – Amazon’s Customer Review. 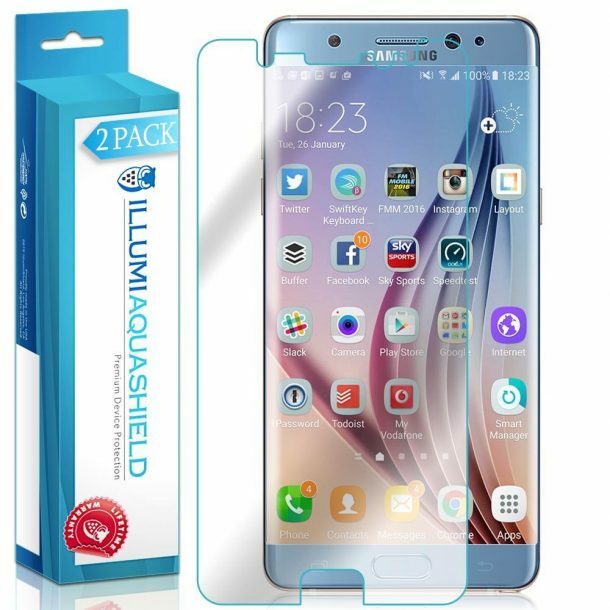 This Samsung Note 7 screen protector has been specifically designed using the precise laser technology to offer maximum screen coverage. The unit features self-healing, flexible, tough, military-grade thermoplastic urethane, designed to absorb impact. It has an easy, error-proof, bubble free installation and the liquid allows adjustments during installation. The TechSkin is resistant against scratches, punctures, UV light and will not yellow. A great buy. This screen protector features full-screen coverage with material flexibility allowing total coverage on curved devices. 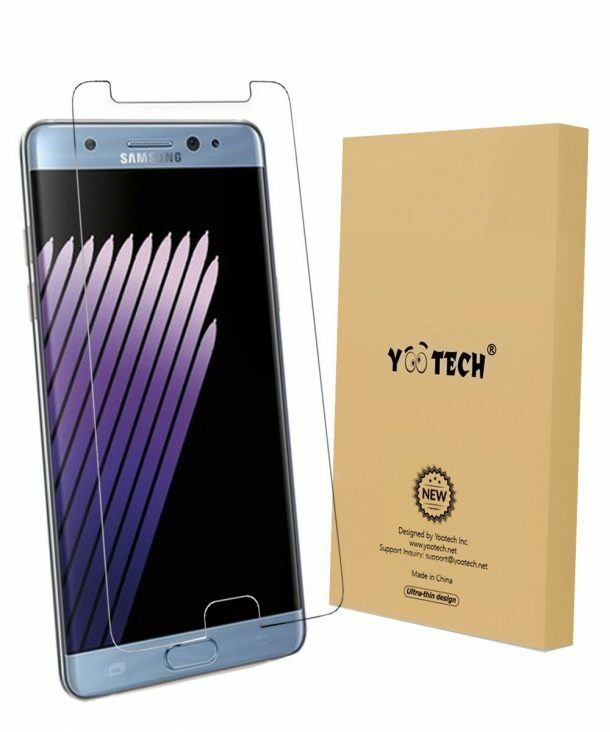 The anti-bubble film and TechSkin is resistant against scratches, punctures, UV light and will not cause yellowing of the screen. 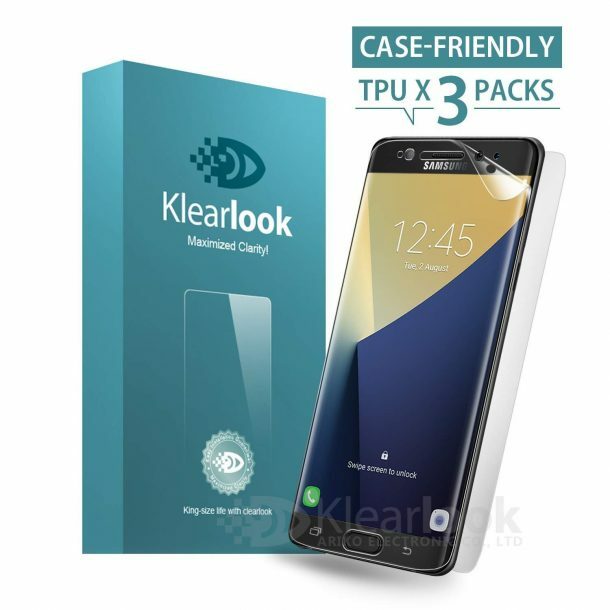 It protects your screen well from scratches, dust and filth and the optically transparent and virtually invisible screen enables you to enjoy your phone’s high definition 1080p experience. “What an incredible screen protector. It was so easy to install, and the box itself was very professional looking. The tools provided allowed me to install the screen protector easily.” – Amazon’s Customer Review. 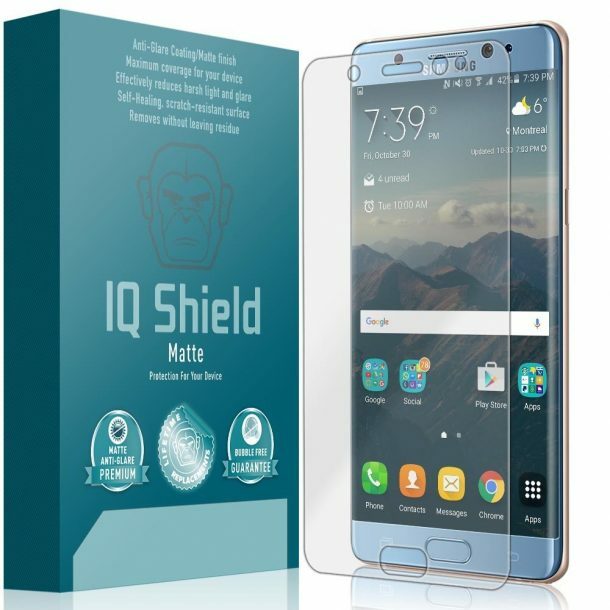 This is IQShield Matte Finish protector reduces glare and allows the user to enjoy an ultra-bright endless experience. The outer coating prevents dust, grime and fingerprints and it ensures an ultra-thin and extremely durable covering. “This is made of an excellent plastic film. I have used many of these types of screen protectors and from my experience with them, I can tell this is superb quality. It comes with everything you need for installation. ” – Top 1000 Reviewer of Amazon. This is a liquid skin protector shield by IQShield. 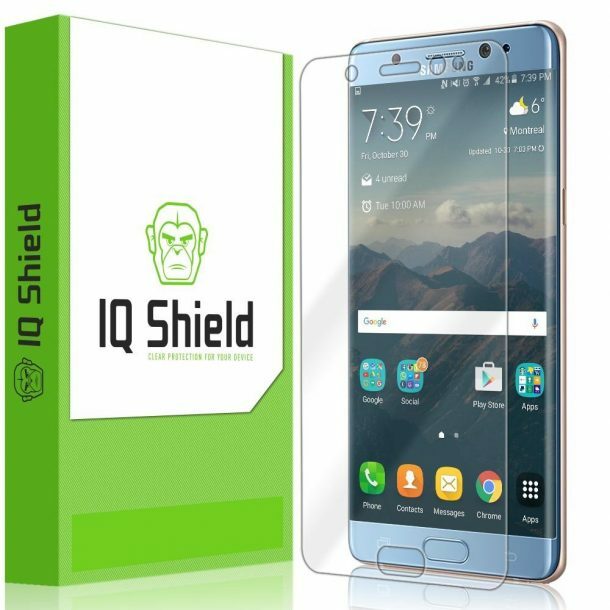 This ultra-protector is coupled with unique IQ shield which ensures super easy, bubble-free, anti-fingerprint and frustration free installation. The layered PET film and ballistic tempered glass enable high response sensitivity, self-healing and non-yellowing glass with a flexible but tough guard. This skin once applied seamlessly merges into the mobile screen. “I was so excited to see this come in the mail. I can never have enough screen protectors, and I know that this one is great. I have gotten them from this company in the past, and I know that I will again. These go on so smooth. Just follow the directions and there will be no bubbles. It is that easy. It comes with everything that you need to get this on, and it will go on and stay on the phone. These are great. It comes will package so it does not get ruined when being delivered as well. so that’s also great. ” – Amazon’s Customer Review. This is an anti-scratch case friendly screen protector by Yootech. The unit is self-healing, flexible yet tough and the military grade thermoplastic urethane is designed to absorb shocks and impacts. It is easy to install and has an easy error-proof and bubble-free installation which significantly reduces oils, smudges, and fingerprints. “It looks as if nothing is on the screen once it sets. The material it is made of is designed to be scratch proof and yellow resistant. This is described as a military grade tough screen protector, and so far it has not disappointed. Overall I am very satisfied with this product. ” – Amazon’s Customer Review. Which screen protector are you getting for your Galaxy Note 7? We would appreciate your valuable feedback in the comment section below. Thanks for finally talking about >10 Best Samsung Galaxy Note 7 Screen Protectors <Loved it!